Three Diamonds Farm’s Roman Approval, three times a bridesmaid in Grade III stakes company, will attempt to breakthrough with a victory as the 117-pound starting high weight in field of seven older horses that were entered for Saturday’s 79th running of the $100,000 Louisville Handicap (GIII) at Churchill Downs. The Louisville Handicap, a 1 ½-mile marathon over the Matt Winn Turf Course, is one of two stakes events on the 11-race program that also includes a simulcast of Preakness Day action from Baltimore’s Pimlico Race Course. Churchill Downs’ first race is 12:45 p.m. (all times Eastern). The Lou ’Cap goes as Race 6 at approximately 3:16 p.m. and the 11th running of the $65,000-added Opening Verse Overnight Stakes, a one-mile grass event for 3-year-olds and up, is the 11th and final race at approximately 5:52 p.m. The 141st running of the $1.5 million Preakness Stakes (GI), the Middle Jewel of the Triple Crown headlined by the Kentucky Derby one-two punch of unbeaten Nyquist and runner-up Exaggerator, goes as the 13th of 14 races at Pimlico at approximately 6:45 p.m. The race will be shown on television monitors throughout Churchill Downs, including the massive Big Board. Roman Approval, a 5-year-old Kentucky-bred son of Roman Ruler, has banked $347,185 for Three Diamonds Farm since he was claimed for $25,000 at Saratoga on Aug. 20, 2014. During that span, he’s posted a record of 4-6-2 in 17 starts, including a runner-up effort to The Pizza Man in the 2015 Stars and Stripes (GIII) at Arlington Park and seconds to Chocolate Ride this winter in the Col. E.R. Bradley (GIII) and Fair Grounds (GIII) handicaps at Fair Grounds. Roman Approval, who boasts an overall record of 30-7-14-3—$426,063, is conditioned by Mike Maker, who saddled Dark Cove to victory in the 2013 Louisville Handicap. 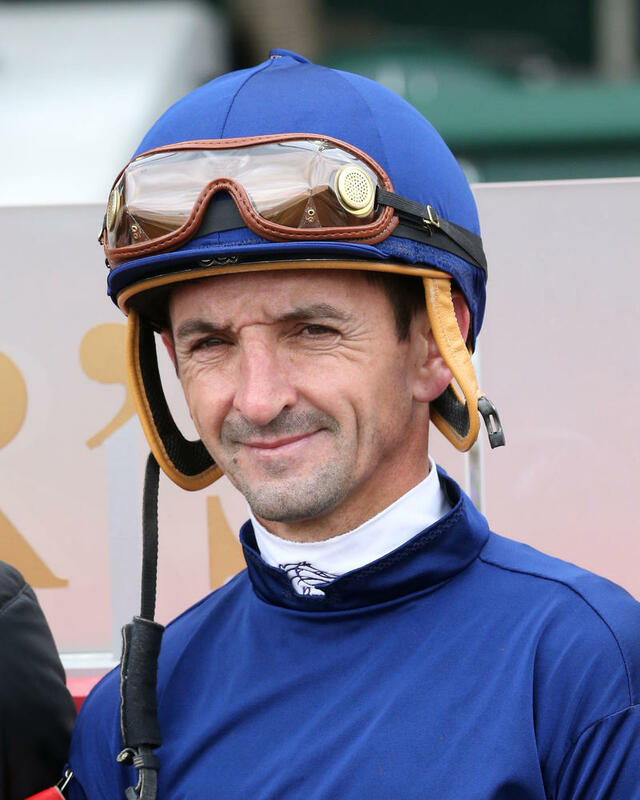 He’ll break from post 2 under jockey Robby Albarado, who has won the race a record-equaling four times: Pisces (2002), Silverfoot (2004-05) and Lattice (2008). The Louisville Handicap field from the rail out (with jockeys and assigned weight): Tiz Town (Brian Hernandez Jr., 112 pounds); Roman Approval (Albarado, 117); Bullards Alley (Francisco Torres, 114); Johns Kitten (James Graham, 114); Aldous Snow (Joe Rocco Jr., 115); Wireless Future (Shaun Bridgmohan, 115); and Dynamic Sky (Channing Hill, 116). Sam-Son Farm’s 7-year-old gelding Aldous Snow (30-5-5-3—$546,339) and John C. Oxley’s 6-year-old Dynamic Sky (29-5-6-7—$1,087,828) are Grade III winners. Aldous Snow won back-to-back runnings of the Singspiel (GIII) at Canada’s Woodbine in 2014-15 for trainer Malcolm Pierce. Dynamic Sky, the lone millionaire in the field, seeks his first victory for trainer Mark Casse since defeating Big Blue Kitten in the 2014 Red Smith Handicap (GIII) at Aqueduct. A wide-open renewal of the Opening Verse, which serves as a local steppingstone to the $200,000 Wise Dan (GII) over 1 1/16 miles on grass on June 18, includes Randy Bloch, Phil Milner, John Seiler and Amtietan LLC’s Thatcher Street, runner-up to Heart to Heart in last fall’s River City Handicap (GIII) for trainer Ian Wilkes, and Abdullah Saeed Almaddah’s Green Mask, who’ll attempt to stretch out his turf-sprint form in his first start for trainer Brad Cox. The Opening Verse field (with jockeys): Thatcher Street (Hernandez); Green Mask (Rocco); Dimension (GB) (Declan Cannon); Slip By (Jesus Castanon); Hammers Terror (Albarado); Aztec Brave (FR) (Gary Stevens); Kulik Lodge (Graham); Dac (Sophie Doyle); R. Great Adventure (Chris Landeros); Potomac River (Juan Vargas); Pleuven (FR) (Hill); and One Touch (Torres). Behesht (FR) (Miguel Mena) is on the also-eligible list. All starters will carry 122 pounds. Churchill Downs admission gates will open Saturday at 11:30 a.m. General Admission is $5, reserved seating is $10 and reserved dining packages are $47. Tickets can be purchased in advance online at ChurchillDowns.com/Tickets. The first 5,000 fans through the gates will receive a free Kentucky Derby 142 commemorative poster.